The 2011 NSW state election delivered a swag of seats in western Sydney to the Liberal Party. Widespread dislike and distrust of, and disgust with the ALP re-focused the attention of many of the formerly Labor-voting ethnic communities on the potential benefits of a coalition government. In particular the Lebanese Muslim Association had thrown its weight behind the Liberals and a raft of Muslim independents, while the Labor machine centred on Eddie Obeid and his lieutenants crumpled under the corrosive evidence of corruption and what the Americans call “ward-heeling”. Over the past four years trends evident at that time have taken new directions. The Obeid Labor machine, which had kept Muslims out of the parliament, has been replaced in many areas by invigorated networks run by younger ambitious Lebanese Muslim, Indians, Bangladeshis and Turks, in addition to the already entrenched Chinese and Koreans. Class mobility in many of these communities has transformed the leadership from first generation often public sector union types, into more middle class activists ranging from real estate agents and developers to entrepreneurs, accountants and financiers (eager to enjoy the local property booms). Communities from the sub-continent include many fluent English-speakers whose capacity to engage with Australian politics has been far more rapid than some of the earlier communities from non-English speaking backgrounds. The changes were first evident in the transformation of local councils throughout Sydney’s west and south west. For instance Burwood Council offers translations in Arabic, Greek, Mandarin and Korean: it overlaps with the state seat of Strathfield where Labor Mayor John Faker was likely to be the successful candidate until the ALP parachuted Jodi McKay into the seat. Nearby the seat of Auburn would have seen Muslim Lebanese Australian and former mayor Hicham Zraika replace Christian Lebanese Australian Barbara Perry MP as Labor candidate; they were both pushed aside as Labor leader Luke Foley gained pre-selection. Auburn’s Liberal mayor Ronney Oueik, a Lebanese of dual religious backgrounds, is pushing the local card, while a group called Changeauburn has taken aim at Foley as a non-local, pro-Armenian, pro-Israel blow-in, touching on as many local prejudices as can be found – given the strong Turkish and Arab population. Hovering in the background is Gallipoli, its centenary barely a month away from the election date. While the wider community may think Gallipoli was about Anzac and the heroism of young diggers, in the world of Auburn and Strathfield and Lakemba and Willoughby and close by, 24 April 1915 marked the commencement of the horrific killings that have become known as the Armenian Genocide. Armenian leaders were rounded up in Istanbul as potential collaborators with the allies boarding the landing boats in the dark off Anzac cove. That moment of memory reverberated with Koreans remembering the violence against the women forced into wartime prostitution, and the Chinese remembering the Japanese massacres of Nanjing residents in 1937. The Armenians are also close to the Pontian and Cypriot Greeks, the Assyrians and other eastern Christian groups who suffered under the Ottoman empire and its immediate successors. All of this would be by-the-by were it not for a draft state government circular that appeared late last year warning local councils to be wary of allowing local celebrations of overseas events that might stimulate local inter-group hostility, by naming the perpetrators. (It should be noted Multiculturalism NSW denies it ever issued the memorandum and the Australian Turkish Advocacy Alliance verballed it by claiming the draft as a victory for the Turkish and Japanese causes). This draft was seized upon by the ATAA, and the Japanese Community Association, which claimed the government position as a ban on Armenia memorials that might name the Turks as perpetrators, and Chinese and Korean memorials that might defame Japan. In turn the Turks had been outraged by a 2013 bi-partisan NSW parliamentary resolution recognising the events of 1915 as a genocide, a position rejected by the Turkish government. Since that time the ATAA has sought to claw back the public space accorded the Armenians and Assyrians, through a strong use of ‘soft power’, the most recent evidence of which was a memorial friendship wall linked to the RSL and promoted by the ATAA, erected in Auburn in February 2015 recognising Kemal Attaturk as an international hero for reconciliation (much to the anger of Australian Armenian leaders). Kemal had led the troops at Gallipoli that drove the New Zealanders back and ultimately destroyed the allied invasion plan. He also arranged for post-war punishment of the genocide perpetrators to be dissolved, while pushing back a post-war recovery/ invasion by Greek troops of Anatolia. Early in 2015 NSW communities Liberal Minister Victor Dominello was lobbied by the Armenians and the other groups to withdraw the circular. Deputy Leader of the Liberal Party Gladys Berejiklian holds the Armenian-heavy seat of Willoughby, where plans were well-advanced for a 2015 centenary memorial to the victims of the genocide. Dominello immediately ‘withdrew’ the memorandum, and referred the action of the head of the Commission, Hakan Harman, to the head of the public service. His action in abandoning the memorandum was immediately supported by the ALP, and the Greens. Greens multicultural spokesperson Mehreen Faruqi told me that she also supported the withdrawal of the memorandum, though when pressed, admitted she did not fully understand all its ramifications, or indeed that it was only a draft. 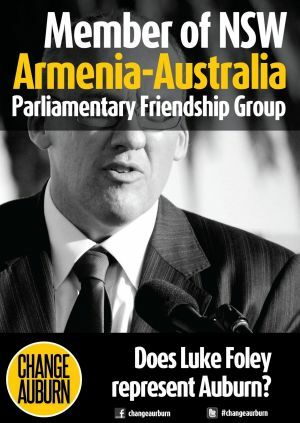 ALP leader Luke Foley told a recent Chinese community even that I attended, he took the same position as Mike Baird (and Dominello and Berejiklian and Faruqi). My attempt to discuss these issues with the ALP spokesperson Catholic Italian Australian Gaetano Zangari MP for the multicultural seat of Fairfield, resulted in promises of a call-back which unfortunately never eventuated. In an interview with Dominello, he argued that the matters should best be dealt with locally, and that the state government had no role to play. Essentially this is a Balkan solution, leaving the Willoughby Armenians clear to do what they will, and the Auburn Turks the same (though the February 2015 memorial wall opening poured serious fuel on the fire of Armenia, Greek and Assyrian anger: they perceived this as confirmation of Turkish government takeover of Multiculturalism NSW) . Except for the double problem created by the parliamentary resolution, pressed by Christian Democrat Fred Nile MLC, and widely seen as both anti-Turkish and anti-Muslim (the Ottoman empire at the time was the seat of the Caliphate), which leaves groups which live in close proximity (Koreans and Japanese for example) thrown into a potential local quagmire of competitive arguments and rising inter-group anger. Multiculturalism has been based on a principle that groups can hold to their own cultural and political values and views, but they do not introduce their unresolved post-wartime hostilities into Australian political life. Indeed Multiculturalism NSW in its various guises over time has been very successful in negotiating truces amongst communities whose young men might otherwise be very violent with each other. Yet in this raft of issues NSW has been placed front and centre in a writhing nest of global soft power conflicts of which it appears to have washed its hands, and Luke Foley embodies far too many of them for his own electoral safety. As well all the relevant consulates are working away in the background, from the Turkish through to the Chinese. Even so an alternative equally attractive principle might be extracted from the activities of the UN (United Nations) group, as the opponents of Multiculturalism NSW’s supposed edict describe themselves. Many of them are fresh from the overwhelming victory over the federal Liberals in regard to the abolition of Section 18C of the Racial Vilification Act. They could be arguing that every citizen has the right to call out for critique perpetrators of heinous human rights abuses, be they Ottomans, Imperial Japanese, or Nazi Germans, all the more so if they were also wartime enemies of the Australian nation. But what if they were our allies then or are our allies now? This entry was posted on March 22, 2015 at 5:57 pm and is filed under Uncategorized. You can follow any responses to this entry through the RSS 2.0 feed. You can leave a response, or trackback from your own site.